If you own a website, chances are you’re doing everything possible to attract visitors. After all, visitors are the lifeblood of the site, and without them your website wouldn’t be doing your business much good. What many website owners fail to realize, however, is that there are a variety of ways to bring visitors in – and with every new social vehicle the opportunities continue to grow. 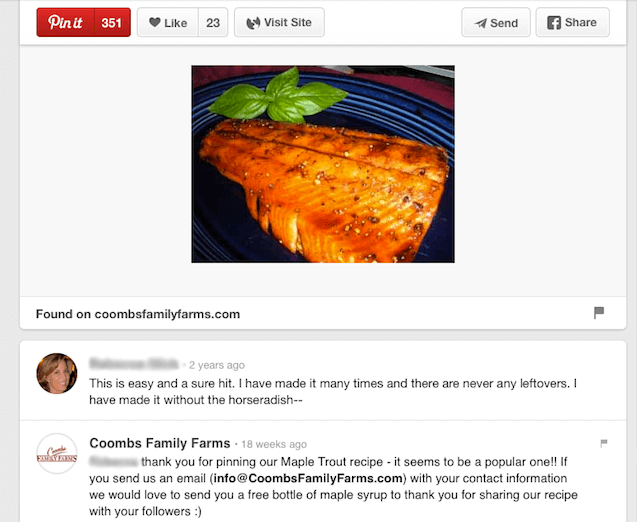 Take for example, VONT client Coombs Family Farms and The Case of the Steelhead Trout on Pinterest. For those not familiar with it, Pinterest is a web and mobile app used for sharing, saving, and creating visual bookmarks (called boards) in such areas as recipes, home décor, art, or gardening – anything that appeals to the user; the possibilities are endless. An integral (and delicious) part of the Coombs website is the recipe section, which lists hundreds of recipes containing maple. Back in February 2014, a visitor used Pinterest to ‘pin’ Coombs’ recipe for Grilled Steelhead Trout Fillets to her recipe board and the results were breathtaking. As more and more people shared her pin, more and more people visited the Coombs Family Farms site to view the recipe. The bottom line? During the first nine months of 2014, fifty-four percent (54%) of all referrals to www.CoombsFamilyFarms.com came from Pinterest. One recipe, one pin, dramatic results. So what’s the takeaway from this story? The first takeaway is that content is exceedingly important to your site. Creating share-worthy content (with enticing visuals) designed to appeal to your target market segments is a great way to build an audience. The second takeaway is that social media provides an increased opportunity for promoting your content – both through your own sharing and through the sharing of others. The final takeaway is that it’s key to stay abreast of the analytics for your site. Know what content is generating the most traffic. Because VONT saw the traffic coming in from the pin, we were able to work with Coombs Family Farms to thank the pinner personally with a note on her board… as well as with a free bottle of maple syrup. An added bonus is that each subsequent pinner will view Coombs’ response, and by doing so provide more ‘free’ PR for the company. Digital Marketing Plan for Food & Beverage Brands? Click here! Combine the 1/3 cups soy sauce and maple syrup. Place the fillets in a large glass pan and pour the mixture over. Place fillets in refrigerator. Pour remaining soy sauce and maple syrup into a small saucepan. Simmer for 2-3 minutes in order to thicken. Add horseradish. Set glaze aside. Preheat grill to high. Remove fillets from refrigerator and sprinkle with freshly ground black pepper. Oil grill well with vegetable oil and place fillets flesh side down on the grill. Grill fillets for 3 minutes. Carefully turn fillets and brush glaze over each fillet. Continue cooking for 3 minutes. Brush with additional glaze and turn heat to low until fillets are close to the point of flakiness. Brush with any remaining glaze. For more delicious recipes, visit http://www.coombsfamilyfarms.com/blog-home/maple-recipes/ .